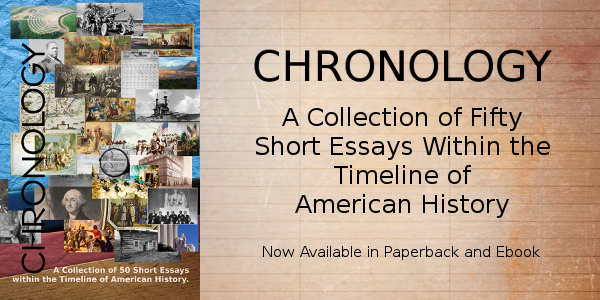 The world was at war as the decade began, all within the confines of a great depression that was affecting the lives of all Americans, but when Pearl Harbor was attacked, the United States could no longer be on the sidelines. Through the courage and dedication of the soldiers who fought in the European or South Pacfic theaters, they spent much of this decade in a battle for a way of life that the country and western powers had spent two centuries building. By the end of the decade, that war would be won and the build back on the front burner. President Franklin D. Roosevelt, circa 1940. Courtesy National Archives. 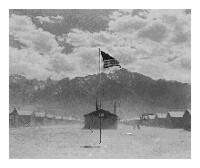 Manzanar War Relocation camp of Japanese detainees during World War II. Photo: Department of the Interior, July 1942. Courtesy National Archives. Take your time and enjoy the view. There are so many beautiful vistas in our national parks, like the one in the Great Smokies above, pull off the side of the road, and take it all in. Those photos will remind you of the great times you have had discovering our beauty and history. 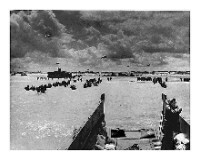 Photo above: Troops from the United States and other Allied nations land on the beach at Normandy, France in 1944, beginning the western European invasion that would lead to defeat of Nazi Germany. Courtesy National Archives. Right: British military officers in the North African desert in 1941. Courtesy Library of Congress. Sponsor this page for $275 per year. Your banner or text ad can fill the space above. April 1, 1940 - The 1940 census indicates a United States population of 132,164,569. This represented an increase of 7.3% since 1930, the lowest rate of increase in the 20th century. The center of the United States population was geographically placed two miles southeast by east of Carlisle, Indiana. June 3, 1940 - The United States government approves a sale of surplus war material to Great Britain. June 14, 1940 - On the same day Paris fell to the German army and Auschwitz received its first Polish prisoners, the Naval Expansion Act is signed into law by President Franklin D. Roosevelt, increasing the capacity of the U.S. Navy by 11%. Four days earlier, Roosevelt had condemned the actions of Italy's declaration of war against France and the United Kingdom. September 2, 1940 - The Great Smoky Mountains National Park, the most visited park in the National Park Service today, is officially dedicated by President Franklin D. Roosevelt. 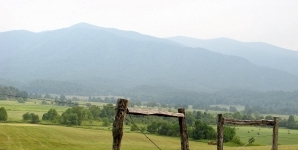 The park, whose land had been acquired in part by John D. Rockefeller, Jr. with a $5 million contribution, straddles the North Carolina and Tennessee state lines. September 16, 1940 - The U.S. Congress approves and enacts the first peacetime conscription draft. November 5, 1940 - President Franklin D. Roosevelt continues his dominance of presidential politics with a 449 to 82 Electoral College victory over Republican candidate Wendell Wilkie, winning his third presidential election. Roosevelt becomes the first man to hold office for three terms. March 11, 1941 - The George Washington Carver Museum is dedicated at the Tuskegee Institute with the participation of such luminaries as Henry Ford. The museum is now part of the Tuskegee Institute National Historic Site. March 11, 1941 - The Lend-Lease Act is approved, which provided $7 billion in military credits for American manufactured war supplies to Great Britain and other allies; in the fall, a similar Lend-Lease pact would be approved for the USSR with a $1 billion loan. July 7, 1941 - The United States occupies Iceland, taking over its defense from Great Britain and attempting to thwart a potential invasion by Nazi Germany. August 14, 1941 - An eight point declaration of principles called the Atlantic Charter is issued by President Roosevelt and Great Britain Prime Minister Winston Churchill. September 28, 1941 - Ted Williams ends the 1941 season with a batting average over 0.400, the last player to accomplish that feat. February 19, 1942 - Executive order 9066 is signed into law by President Franklin D. Roosevelt, confining 110,000 Japanese Americans, including 75,000 citizens, on the West Coast into relocation camps during World War II. The remains of the first of these detention camps resides in California's Manzanar National Historic Site. These camps would last for three years. June 4-7, 1942 - The Battle of the Midway is fought at Midway Islands in the Pacific with the Japanese fleet encountering its first major defeat of the war against the United States military. As the Battle of Midway comes to an end on June 7, Japan invades the Aleutian Islands, the first invasion of American soil in 128 years. June 20, 1942 - The development of the first atomic bomb is signed into agreement between the Prime Minister of Great Britain, Winston Churchill, and President Franklin D. Roosevelt in Hyde Park, New York. August 7, 1942 - The United States Marines land on Guadalcanal in the Solomon Islands in the first American offensive of World War II. A naval battle would commence on November 12 for three days with the U.S. Navy able to retain control despite heavy losses. November 8, 1942 - North Africa is invaded by the United States and Great Britain. December 2, 1942 - The first nuclear chain reaction is produced at the University of Chicago in the Manhattan Project, creating fission of the Uranium U-235, under the direction of physicists Arthur Compton and Enrico Fermi. February 14, 1943 - The United States encounters its first major defeat in the European theater of World War II at the Battle for Kasserine Pass in Tunisia. April 13, 1943 - The Jefferson Memorial in Washington, D.C. is dedicated on the 200th anniversary of Thomas Jefferson's birth by President Franklin D. Roosevelt. June 21, 1943 - Race riots in Detroit and Harlem cause forty deaths and seven hundred injuries. July 10, 1943 - The United States Army's 45th Infantry Division lands on the island of Sicily, starting the campaign of Allied invasion into Axis-controlled Europe. Nine days later, Rome is bombed by Allied forces. The conquest of Sicily would be completed on August 17 when U.S. forces under General Patton and British forces under Field Marshall Montgomery arrive. November 28, 1943 - The Tehran Conference is held for three days, concluding in an agreement between U.S. President Franklin D. Roosevelt, British Prime Minister Winston Churchill, and Soviet leader Josef Stalin about a planned June 1944 invasion of Europe with the code name Operation Overlord. June 6, 1944 - The Normandy Invasion, D-Day, occurs when one hundred and fifty-five thousand Allied troops, including American forces and those of eleven other Allied nations (Australia, Belgium, Canada, Czechoslovakia, France, Greece, the Netherlands, New Zealand, Norway, Poland, and the United Kingdom) land in France. Allied soldiers stormed the beaches of France to begin the World War II invasion of Europe that would lead to the liberation of Paris. Operation Overlord gained footing quickly, pushing through the Atlantic Wall in the largest amphibious military operation in history. June 22, 1944 - The G.I. Bill of Rights is signed into law, providing benefits to veterans. 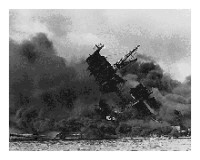 July 17, 1944 - The greatest continental U.S. tragedy of World War II occurs when two ships loading ammunition at Port Chicago Naval Weapons Station in California explodes. The accident killed three hundred and twenty people. July 21, 1944 - The United States military begins to retake the island of Guam after Japanese troops had occupied the island during World War II. The battle would end on August 10. November 6, 1944 - The last campaign speech of Franklin D. Roosevelt, seeking his fourth term in office, is broadcast from his Hyde Park, New York home. One day later, Roosevelt would gain that fourth term by a significant, but smaller margin than any of his previous elections, especially in the popular vote where Dewey lost by only three and one half million votes. The Electoral College margin, however, at 432 to 99, insured Roosevelt good footing in prosecution of World War II. December 18, 1944 - The United States Supreme Court rules in the case of Korematsu vs. the United States, the wartime internment of Japanese Americans on the West Coast was valid during a time of war. February 4-11, 1945 - President Roosevelt, Prime Minister Churchill, and Premier Josef Stalin hold the Yalta Conference in the Soviet Union. February 19, 1945 - Thirty thousand United States Marines land on Iwo Jima. On April 1, American troops invade Okinawa, beginning the Battle of Okinawa, which would continue until June 21. March 1, 1945 - American troops cross the Rhine River at Remagen, Germany. Two weeks later, on March 18, twelve hundred and fifty U.S. bombers attack Berlin, causing Adolf Hitler to announce the destruction of his own industries and military installations one day later. April 12, 1945 - President Roosevelt dies suddenly; Vice President Harry S. Truman assumes the presidency and role as commander in chief of World War II. May 7, 1945 - The unconditional surrender of Germany at Reims, France concludes the military engagements of World War II in Europe. It is accepted by General Dwight D. Eisenhower in his role as the commander of Allied troops in the European theater of the war. July 16, 1945 - The first atomic bomb, the Trinity Test, is exploded at Alamogordo, New Mexico, after its production at Los Alamos. August 6, 1945 - President Harry S. Truman gives the go-ahead for the use of the atomic bomb with the bombing of Hiroshima. 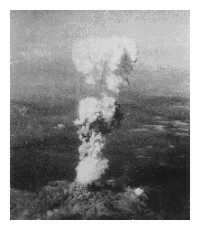 Three days later, the second bomb is dropped on Nagasaki, Japan. On August 15, Emperor Hirohito of Japan surrenders. January 10, 1946 - The first meeting of the United Nations general assembly occurs after its founding on October 24, 1945 by fifty-one nations, including the Security Council nations of China, France, the Soviet Union, the United Kingdom, and the U.S.A. These actions would lead to the disbanding of the League of Nations on April 18, when its mission was transferred to the U.N.
April 1, 1946 - Four hundred thousand mine workers begin to strike, with other industries following their lead. June 6, 1946 - The Basketball Association of America, known as the National Basketball Association (NBA) since 1949 after its merger with the rival National Basketball League, is founded. July 4, 1946 - The island nation of the Philippines is given their independence by the United States. This ends four hundred and twenty-five years of dominance by the west. August 1, 1946 - The Atomic Energy Commission is established. March 12, 1947 - The Truman Doctrine is announced to the U.S. Congress. When passed it would grant $400 million in aid to Greece and Turkey to battle Communist terrorism. President Harry S. Truman implements the act on May 22. April 2, 1947 - The United Nations Security Council unanimously approves the trusteeship of Pacific Islands formerly controlled by Japan to the United States. April 15, 1947 - Jackie Robinson breaks Major League Baseball's barrier against colored players when he debuts at first base for Branch Rickey's Brooklyn Dodgers. April 25, 1947 - Theodore Roosevelt National Park is established by President Harry Truman along the Little Missouri River and scenic badlands of North Dakota. June 5, 1947 - Secretary of State George C. Marshall proposes aid extension to European nations for war recovery, known as the Marshall Plan, which would lead to Congressional approval of $12 billion over the following four years. June 20, 1947 - President Harry S. Truman vetoes the Taft-Hartley Labor Act that would have curbed strikes, only to be overridden by Congress on June 23. April 1, 1948 - The Soviet Union begins its land blockade of the Allied sectors of Berlin, Germany. A counter blockade by the west was put into effect, as well as a British and U.S. airlift of supplies and food, until both blockades were lifted on September 30, 1949. April 30, 1948 - The Organization of American States is founded by twenty-one nations to provide a mutual security pact after World War II. 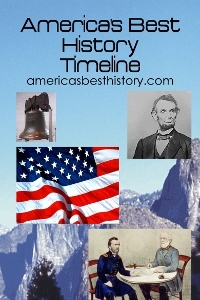 Founding nations were Argentina, Bolivia, Brazil, Chile, Columbia, Costa Rica, Cuba, Dominican Republic, Ecuador, El Salvador, Guatemala, Haiti, Honduras, Mexico, Nicaragua, Panama, Paraguay, Peru, the United States, Uruguay, and Venezuela. July 26, 1948 - Executive Order 9981, ending segregation in the United States military, is signed into effect by President Harry S. Truman. November 2, 1948 - President Harry S. Truman rallies from behind, capturing his first president election from the supposed winner Thomas E. Dewey, the governor of New York. Headlines in national newspapers had overtly announced a Dewey victory, only to be proven wrong. Truman won the Electoral College vote with 303 to Dewey's 189, with Strom Thurmond, running as the States' Rights candidate, receiving 39 Electoral votes. Truman won the election with less than 50% of the popular votes, with additional candidate, Henry Wallace, siphoning off over one million votes in the four man race. December 15, 1948 - Alger Hiss, former State Department official, is indicted for perjury in connection to denials of passing state secrets to a communist spy ring. He would be convicted of the conspiracy on January 21, 1950 and receive a five year sentence. March 2, 1949 - Captain James Gallagher lands the B-50 Lucky Lady II in Texas after completing the first around-the-world non-stop airplane flight. It was refueled four times in flight. April 4, 1949 - NATO, the North American Treaty Organization, is formed by the United States, Canada, and ten Western European nations (Belgium, Denmark, France, Iceland, Italy, Luxembourg, Netherlands, Norway, Portugal, United Kingdom). The treaty stated that any attack against one nation would be considered an attack against them all. June 29, 1949 - United States withdraws its troops from Korea. October 7, 1949 - Tokyo Rose, the femme fatale of Japanese war broadcasts, is sentenced to ten years in prison. She would be paroled in 1956 and pardoned in 1977. October 14, 1949 - Eleven leaders of the United States Communist party are convicted of advocating a violent insurrection and overthrow of the U.S. government. The Supreme Court would uphold the convictions on June 4, 1951. Japan bombs the U.S. Pacific Fleet at Pearl Harbor, Hawaii, on December 7, 1941. 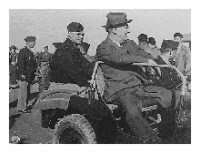 President Franklin D. Roosevelt, General Eisenhower, and General Patton in Castelvetrano, Sicily, December 8, 1943. The decision of new President Harry Truman in Washington to curtail the war by sending in the atomic bomb. Photo of the billow of smoke from Hiroshima atomic bomb on August 6, 1945. Photo: Department of the Air Force.